Almonds are one of the healthiest wholefoods out there – rich in vitamin E, B, fibre, magnesium, calcium and good fats. The Good Parsi Husband LOVES a box full of nuts to snack on at work, and almonds always feature prominently in the mix. 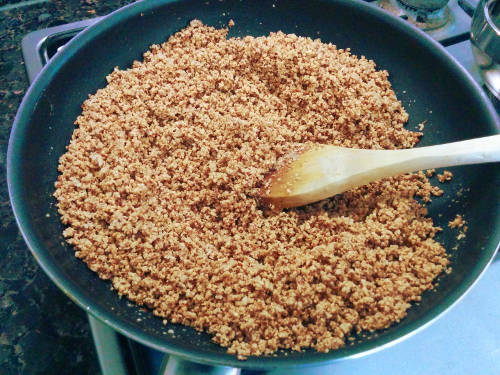 Almond meal is also a great gluten-free alternative to wheat flour. As My Good Irani Mum has chosen to omit wheat from her diet for the past few years, I often bake cakes for my family with almond meal instead so she can taste and critique my baking. Almonds have been used in cuisines from all around the world for hundreds of years. This dish, native to the Parsis, is a traditional sweet which is eaten at any time of the day in square shapes, or if you’re from my family, straight from the spoon! Mum made this for me regularly when I was pregnant and once the Good Parsi Kid was born, as it’s a nutritious snack filled with energy and goodness. Badaam Pak can last in the fridge for up to a month (highly unlikely as it will be eaten WAY before that!) if stored in a clean air tight container. You can also store the sweet in small containers and freeze. This way you can remove to eat as necessary and then store in the fridge. You can also flatten the mixture onto a sheet of baking paper and then slice into squares, or you can roll into little balls for a quick snack. Mum has kindly let me share her recipe with you, so let’s get started! Ingredients at the bottom of the post as always. 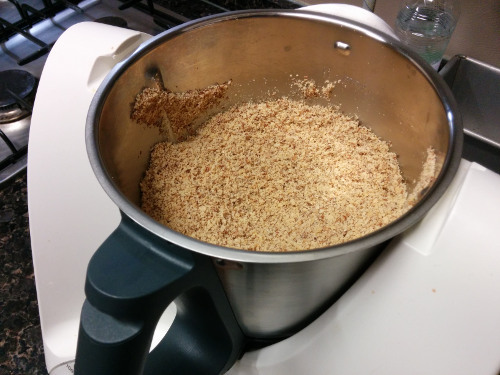 Firstly, grind the almonds to a medium fine powder with the skin on. Leave aside in a bowl. Next, pour the water into a medium mixing bowl and whisk in the milk powder 2 heaped tablespoon at a time. 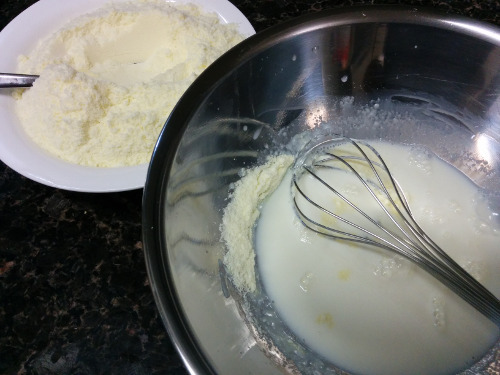 Keep adding the powder and whisk vigorously until all the powder is fully dissolved with no clumps. Keep aside. Add the rosewater and sugar into a small pot and bring to the boil on medium heat. Mix continually with a wooden spoon until the sugar completely dissolves. Keep boiling on medium-low heat for 15-20 minutes. 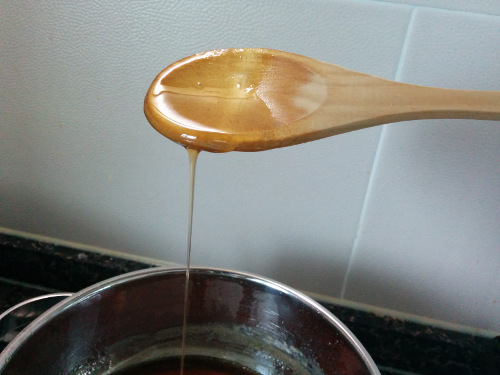 Shut the heat, let the syrup stop boiling, and then check if you have a ‘one string’ syrup consistency – that is when you pour some syrup from the spoon, it dribbles down in a thin continuous string. If you don’t notice this, continue to boil for a further 5 minutes or until you get the right syrup consistency. Remove pot from the heat to cool for a couple of minutes. 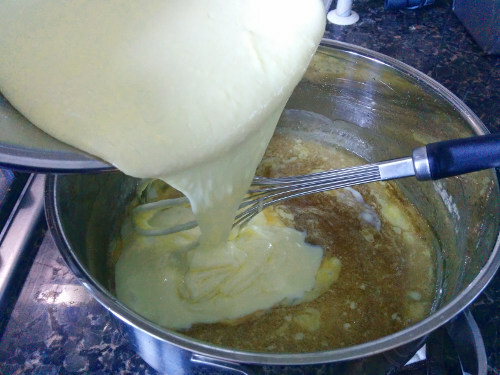 Now, add the milk mixture to the syrup, stir to combine thoroughly and leave aside. In a medium sized non-stick wok, add the ghee and heat for a minute. 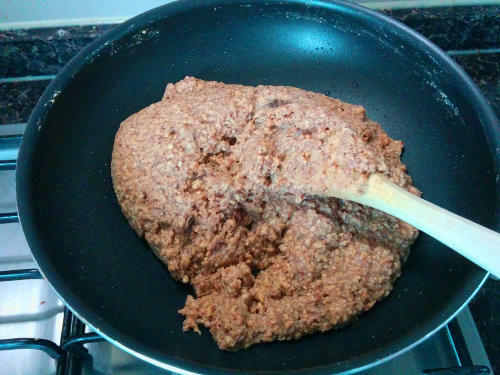 Add the ground almonds and fry for 5 to 10 minutes on low heat until light brown and you smell a nice toasted aroma. Be careful not to burn the almonds. Add the milk/syrup mixture to the almonds and continue to stir on low heat until it bubbles nicely and starts to thicken. Keep stirring until mixture thickens and becomes sticky. This can take 5 to 10 minutes. Please be patient and do not increase the heat as this can cause the sugar and nuts to brown too much. Remove the wok from the stove, and leave to cool for 5 minutes. Then add the spices and stir well. Cool the entire mix down completely and there you have it – authentic Parsi Badaam Pak made from scratch in the comfort of your own home! You can easily double or halve this recipe. Please note that you will need to increase or decrease cooking times by approximately 20% to achieve the same consistency. ENJOY! This looks delicious! Well done Shaz! As always you are a winner Shaz….keep up the good work my darling granddaughter. Yummy 🙂 will have to try to make this soon! Seems really tasty and easy to make. With Mani Bappi…around nothing can go wrong! Bawi bride … thank you for sharing yummy recipes . I have tried the kolmi ni curry, French beans and today tried the badam paak and I am so satisfied with the results. Please keep sharing yummy recipes. Thank you . Good luck and God bless. 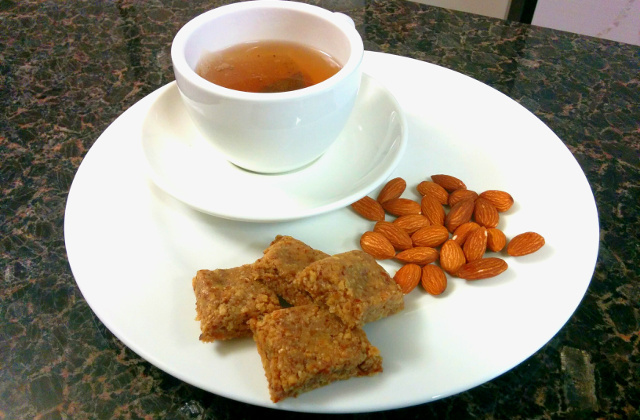 Great recipe for badam pak.